This book contains very weak arguments, if you can call what Haught wrote in this book arguments at all. He seems to keep coming back to admitting that “Faith is belief without evidence.” He has no solid reasons for convincing the reader that one should believe without any evidence. I didn’t find any logical reasons for believing without evidence, as he suggests throughout the book. One of my favorite illustrations of this lunacy is when he uses the story of Abraham and Isaac as an example. Haught says that when readers find this story morally repulsive (God asked Abraham to murder his son Isaac to “test his faith”), they really shouldn’t see it as the gruesomely immoral and murderous story that it is .. they should not be offended. If we see the story in this light, we are only giving it a “plain reading” (i.e. unscholarly). What we’re really supposed to get from the story is the “florid motifs of promise, fidelity and liberation …” Oh, please! Haught attempts to cover up this story of attempted homicide with pretty words. Sorry, I didn’t identify with those “florid motifs” when I read the story of Abraham and Isaac from the “holy scriptures” myself. How can you take away anything good from such a reprehensible Bible story? Do people really read these kinds of stories to their children with a straight face, believing that they’re instilling “morality”? 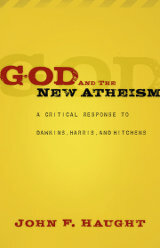 This is only one example of how Haught tries to counter Dawkins, Hitchens and Harris. Most of what he writes is quite honestly, boring. I read this book because I wanted to see what the other side was saying about these three authors’ blockbuster books. Well, Haught really doesn’t say much and offers no good, solid arguments to believe in god or the Bible.